Next up we have a toner which you may have seen on my Instagram! This is also apart of the Seaweed range and this is the Oil Balancing Toner. I am always looking to try out new toner's as it's one product that I have never found one that I always go back to and use everyday. But, over the past month, I have been using this product in every single skincare routine. I feel like this product works so well with everything else that I use, and I'm obsessed. After cleansing, I apply this onto a cotton pad and sweep it over the skin. It sinks in so quickly and leaves my skin feeling really fresh. I believe that this product, alongside everything else has really helped my skin to look so much clearer and brighter. The next two products that I am going to talk about are just my absolute favourites at the moment. I have fallen in love with the range. First up we have The Body Shop Drops of Youth Concentrate. I discovered this serum at a Body Shop event in January. We were showed a variety of products and was able to smell them and feel what the texture was like. As soon as I tested this one on my skin, I knew I had to get one for myself. It honestly it the nicest product to apply to the skin and leaves your skin feeling amazing. I apply this after my toner using the applicator and it's like dropping little drops of heaven onto your skin. I bloody love it. I never thought that the Drops of Youth range was something I needed to use, but at the event they explained to us that our skin starts ageing a lot quicker than we thought, so it's better to start early. 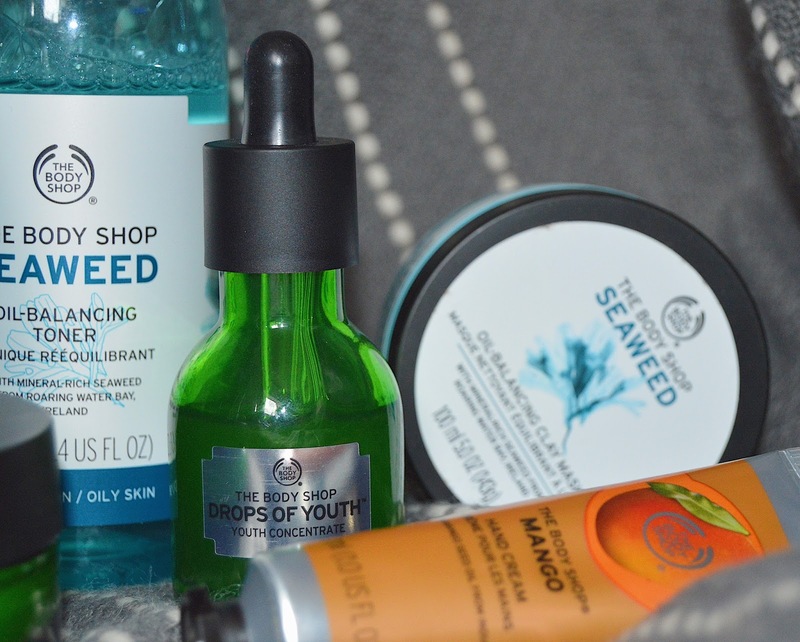 With the amount of pollution in the air rising, I knew that I wanted to have a go with some of these products and give my skin as much help as needed. The other product from this range which I have fallen in love with is the Drops of Youth Bouncy Sleeping Mask. This was one of the products which I was also keen to try and I loved how it felt on my skin when I tested it. It comes in a big tub which I know is going to last me a lifetime and I'm not quite sure how I am going to describe the texture of this product in writing as it wont do it justice! The name does cover it very well, it's a very bouncy texture which is also very moisturising. It is a thicker formula, so you don't need to use that much as a little goes a long way. I have been using this product as a moisturiser after the serum and my skin has been loving it. As I have oily skin, I always thought to stay away from rich moisturisers but I am so gutted I didn't start using them sooner, as my skin has really been thanking me. It leaves my skin feeling super hydrated and soft and when I wake up in a morning, it looks so much brighter and healthier! Next I wanted to talk about a hand cream which I have been loving. I have always been a fan of hand cream and it's something that I will apply multiple times a day and I have done for years. 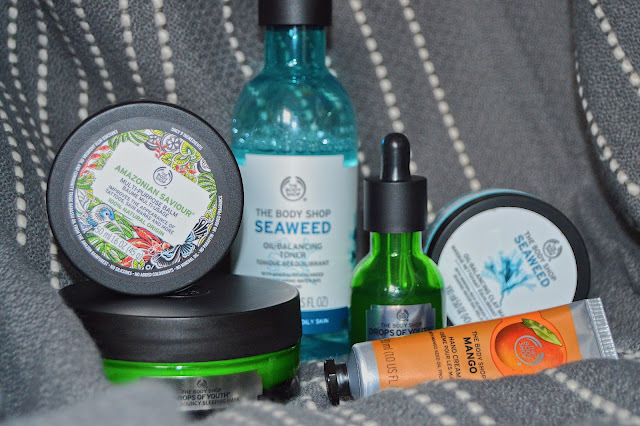 When I went to the event with The Body Shop, I had realised that I have never tried one of their hand creams before. 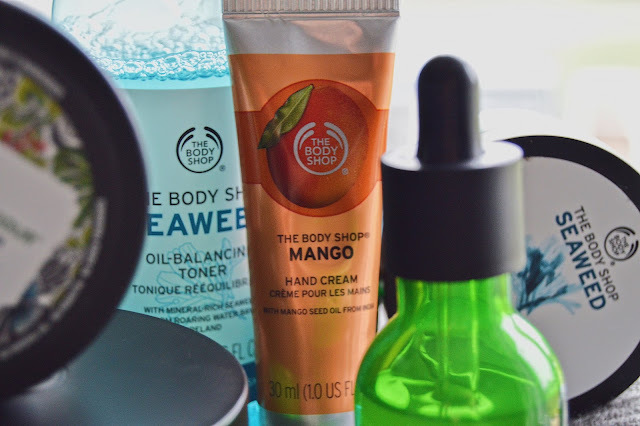 I picked up the Mango Hand Cream and oh my...it smells incredible! The texture is perfect as it isn't too thick that it feels sticky, it just sinks into the skin perfectly. It leaves my hands feeling so soft and smelling amazing. They do offer loads of different smells, so there are so many to choose from. But personally, I am loving the Mango scent. It is something that I always have on me now and I know I will be repurchasing this multiple times in the future. The final product which I wanted to show you is one which you may not think is relevant to you, but it has so much more to it than what you may realise. 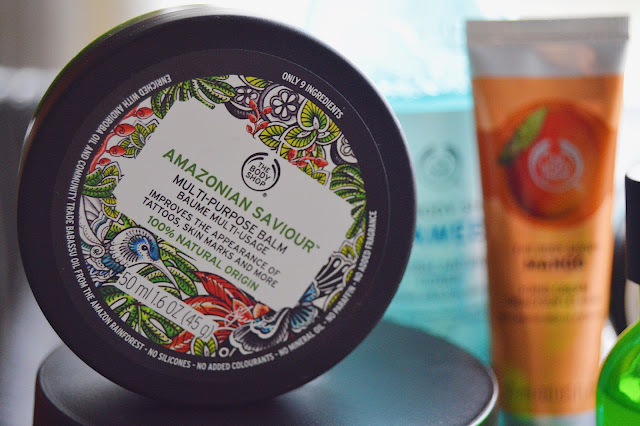 The final product which I have been loving is the Amazonian Saviour Balm. After seeing this on social media, I thought this was just for tattoos but I was wrong. I did purchase this product purposely for my tattoo as I heard a lot of people saying that it has worked wonders on theirs, but once I received the product, I found out it had lots of other purposes too. I have been using this on my tattoo once or twice a week and it makes it look so much better and makes it feel like it's brand new. The appearance of my tattoo has definitely never looked better! This balm can also be used on skin marks, dry skin and more. This product blends really well into the skin and feels like such a high quality product. 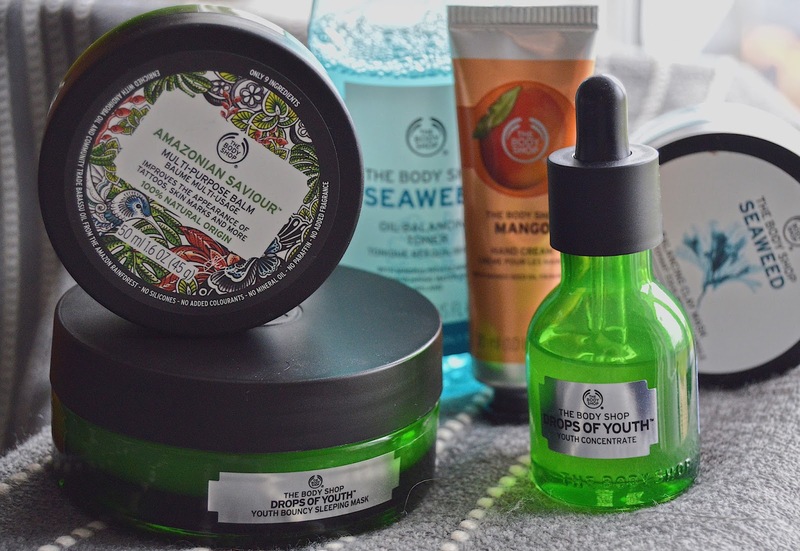 The one thing which I also love about this product is that £1.30 from every sale will be used by The Body Shop's Building Bio Bridges Programme to support conservation and communities by funding Bio-Bridges. The Body Shop are the most incredible brand in terms of helping the world in every way possible. They think about every ingredient and how this impacts other people. They are 100% cruelty free and I love all the work they do to try and ban animal testing on cosmetics. I have mentioned this before on my blog and multiple platforms, but please make sure that you have signed their petition for this! Their work that they do to help the environment and support communities all around the world is inspiring and is why I will always support them in buying their products, signing petitions and sharing their stories. I hope you did enjoy finding out about some incredible products today, I promise you that you wont regret buying any of them! I will be back again next week with another new post!